Patrick Coyle, Paul Auster Story (A2 Poster, 2011). Four art writing projects unfold relationships and possibilities of, for and about landscape. Strategies for observing then recording the results, or maybe the other way around; scores for intervention; missives for those in the field right now or chair- bed- page confined explorers of type/ book/ screen (e)scapes. Handbooks for weaving together art as life life as art art and life, or as yet un-thought combinations of neither. An incomplete textual sample that comes out of Walking (S)miles by Present Attempt. I’m still absorbed in MANUAL FOR MARGINAL PLACES, which I also presented as part of the ART CRITICISM NOW event in Dublin, and whose notion of manual has also been generative for this blog since. A source book, then, documenting (1) letters sent by Sophie Mellor to Emma Cocker whilst the former was spending a short time living without money in Cumbrian towns and countryside; (2) Cocker’s replies in the form of a series of prose texts/ poems on marginality. A dialogue, then, but one open to its breaches as much as its connections. Sophie’s texts are reproduced handwritten notes sent from the field. 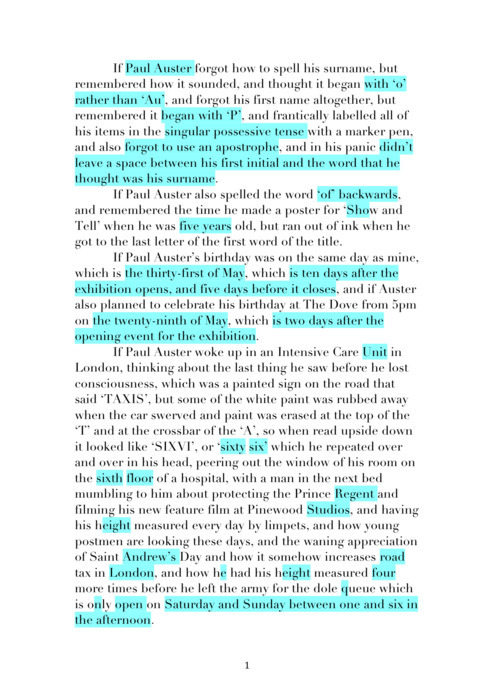 Cocker’s are printed blocks of text on a white page, but their sense of removal is also evident in how their propositional nature removes particulars of person and place, even as it explores a landscape that is both a physical chronicle of nature’s edgelands and a conceptual territory indebted to certain histories of art practice and theory/ philosophy. Some of Emma’s texts have the feel of a list turning towards litany. The absence of gender or identity for the speaker or addressee, but their simultaneous confidence and stridency, allows a phantom “we” and “us” – maybe “I-thou” – to form alongside the text, one which may also seem absurd and with which we may disagree. In other sections this subject is not “he” or ”she” but “one”, a subjectivity that is everyone and no one, self and other, confession and avoidance, a deliberate anachronism. Part of the texts own frame and music, it moves uncertainly beyond it, another way these paragraphs fold back into themselves to better propose themselves as objects of use. Matt Dalby’s @soundpoet twitter project was declared at an end a few months ago, but has thankfully revived. Its temporary termination, however, raised issues about the motivation behind such a project, how and why it sustains itself, how it balances its “found” observations – dependent for their effect on a certain authentic surprise – with how their (artful/ skilled) transcription becomes a style that (it seems to me) may itself determine what later details are selected. Note that for many such details the 140 character limit of twitter is an unnecessary verbosity. Sometimes, half seriously, I think of soundpoet as conceptual poetry for those who don’t like it. I wonder, too, about what the accumulation of these tweets (now more than 5,000) means, and how it translates into a book form (if that is what/where it should translate itself into). There would undoubtedly be pleasure in such a compilation, but I wonder what another form would do with that sense of discovery and NOW that characterises the tweets, or how the book could live as archive and guide book for details both unique and gone but palpably knowable. So each one of them at once modest, urgent, respectful, unreserved. Extremely simple, the most difficult thing: a phrase that doesn’t resemble a phrase. SOURCE: No.34 in David Shields, Reality Hunger (Penguin Books, 2011). The footnotes, which Shields asks readers to cut from the book without reading, identify this paragraph as Jonathan Raban in conversation.